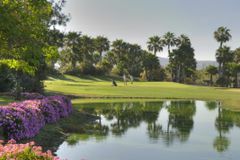 Golf Las Américas is perfectly situated for people staying in the tourist centres of Playa de Las Américas and Los Cristianos, and is a delightful resort course, where the luscious green is in perfect contrast to the woodland and mountain backdrop. We found 37 offers matching your search. The par-72 layout measures 6,607 yards, and is punctuated by charming streams and waterfalls, making it a special place to play. The undulating greens are particularly challenging, and the locals will always advise you to keep the ball below the hole to leave an uphill putt. The proximity of the golf course to the most popular tourist areas makes Golf Las Américas a firm favourite with Tenerife regulars, and comes highly recommended. Always well presented and fun to play. Greens very quick and true with subtle borrows. Fairways well watered and course very well maintained. Bunkers quite tricky- sand not that deep so difficult to play . We enjoyed playing the course very much and mr starter was very helpful and efficient. The course and club house were very good. A challenging course in places. There were 16 in our party and the only downside was one of the starters. He was extremely rude and arrogant. Rather than explain the pace of play in a civil manner he was rude and patronizing with a large hint of aggression thrown in. Not the best way to start a round. Thankfully the other starter present was better and appologised. We really enjoyed this course and it's facilities, superb greens, and the course setup is very interesting, makes you consider a multitude of shots / approaches. Superb facility, and great food, will go there again. Quite flat so can be walked. Fairway turf and the greens were generally well maintained although it is a shame that many golfers fail to replace divots on the fairways or to repair pitchmarks (their own or made by others) but this is a failing of golfers rather than the green keepers. The course has many challenges, including several water features so straight-hitting is an advantage. The greens are quite difficult to read as many of them have some tricky slopes and run-offs. The course plays very fairly with you, with no hidden hazards. What you see (which is very attractive) is what you get. Brilliant course and excellent facilities. Apart from a couple of holes, one day, did not experience any hold ups in 5 rounds of golf, which was an important factor in the overall enjoyment process. Fairways very generous, which is ideal for holiday golf and along with the greens were in excellent condition. We also noted that the pin positions were changed every day.